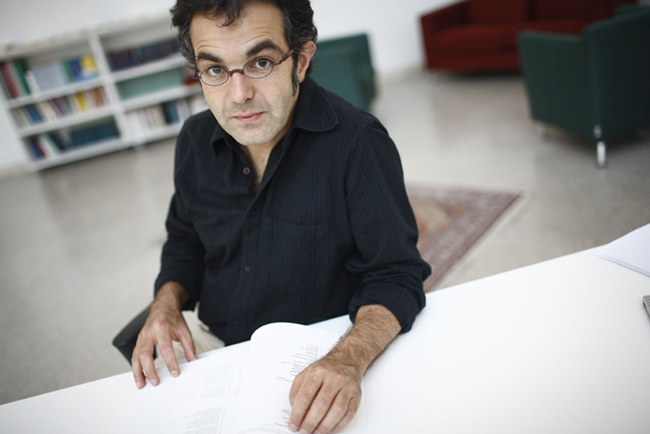 Navid Kermani (1967) is a German writer of Iranian origins and an expert for Islamic studies. He was born in the former West Germany. He received his PhD at Oriental studies and is a member of the German Language academy and the Academy of Sciences in Hamburg. He often deals with matters of religion, immigration and dialogue between Christianity and Islam. From 2000 until 2003 he was a contributor of the Institute for advanced studies in Berlin (Wissenschatskolleg zu Berlin) and in 2008 he received a grant of the German Arts Center “Villa Massimo” in Rome. Since 2009 he was a senior contributor of the Institute of Culturology in Essen (Kulturwissenschaftliches Institute Essen). In 2010 he was a guest lecturer at the “Johann Wolfgang von Goethe” University in Frankfurt within the special program “Frankfurt Poetic Lectures” and during 2011-2012 he was a guest lecturer at the “Georg August” University in Göttingen within the program “Göttingen Poetic Lectures”. He was awarded multiple times for his academic and literary achievements. Among the most recent awards are: the prize for political thinking “Hannah Arendt” (2011) and the “Cultural award of the city of Cologne” (2012). He published numerous works concerning Islam, Middle East and Christian-Muslim dialogue.